"You have earned your membership by your exemplary scholarship. You are a member of Kappa Tau Alpha for life . . . ."
"To my mind the Socratic ideal of 'the examined life' synthesizes the cardinal precepts of professional journalistic practice. You have today pledged your allegiance to worthy utterance - utterance marked by the truthfulness, fairness, and artistry. To honor these standards in your own professional life – whether in reportage or commentary or advertising – will make each of you an exemplar of 'the examined life.' The greatest adventure in life is, after all, the adventure of the human intellect and the human spirit. You are to be congratulated on having proved your worthiness in this great adventure. You are, as it were, the crème de la crème of your own student population. "We salute you and wish you Godspeed." 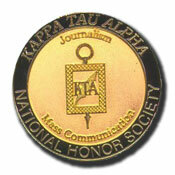 Kappa Tau Alpha is a college honor society that recognizes academic excellence and promotes scholarship in journalism and mass communications. Membership must be earned by excellence in academic work at one of the 91 colleges and universities that have chapters. Selection for membership is a mark of highest distinction and honor. Membership is by invitation only, and is based solely on character and excellence in academic work. Students with a compiled GPA that ranks them in the top 10 percent of their class are invited, provided they meet other stringent requirements including a minimum GPA of 3.5 and 9 credit hours of upper division work in professional journalism and mass communication courses.